Freshly cooked Spanish cuisine for weddings, birthdays, parties & corporate events. We are happy to travel anywhere! Let us bring a little of Spanish sunshine to your event with freshly cooked paella and tapas. We provide an stress-free and professional service for you! We setup, cook, clean and leave, allowing you to fully relax and enjoy your special occasion. We provide a stress-free and professional service for you! We set up, cook, clean and leave, allowing you to fully relax and enjoy your special occasion. Want to try something a bit different, exciting and unforgettable for your guests. Why not have tasty mediterranean cuisine on your special day. Brighten up everyone’s face with a little bit of Spanish sunshine, and be the talk of the town for years to come. Celebrate your birthday or private event in style with amazing and authentic Spanish Paella. This is perfect food for standing or sitting, allowing your guests to laugh and mingle while trying something different. Big Paella looks impressive as well as tasting incredible. We can serve your guests both inside and outside creating a memory nobody will forget. We can provide freshly cooked delicious paella for your corporate event. This is perfect for team building days, annual parties or to fuel you during meetings. Try an alternative to the usual cold sandwich selection. Want to try something a bit different, exciting and unforgettable for your guests? Why not enjoy tasty mediterranean cuisine on your special day. Brighten up everyone’s face with a little bit of Spanish sunshine, and be the talk of the town for years to come. Celebrate your birthday or private event in style with amazing and authentic Spanish Paella. This is the perfect food for standing or sitting, allowing your guests to laugh and mingle while trying something different. Giant Paella Catering looks very impressive as well as tasting incredible. We can serve your guests both inside and outside, creating a memory that no one will forget. 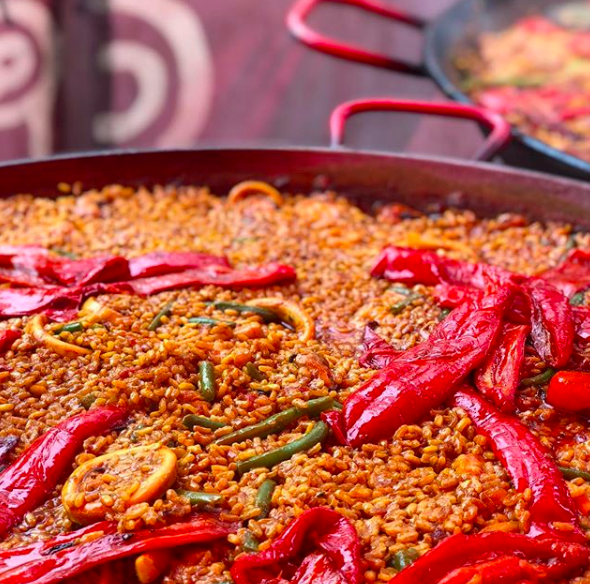 Book our paella party catering service now! We can provide freshly cooked delicious paella for your corporate event. This is perfect for team building days, annual parties or to fuel you during meetings. Try a delicious alternative to the usual cold sandwich selection.